Multifunction- This colorful Climber and Swing Set is a combination of slide, swing and basketball hoop. You can either place it indoor or in the backyard. It doesnât occupy too many spaces. Safety- The material of this indoor playground is HDPE(High-Density Polyethylene) which is durable and environmentally friendly. Also, it is non-toxic and eatable. Every edge is rounded so that toddlers will not get hurt if they hit the slide. Our product passed the ASTM-F963 testing proving it is safe and healthy for kids. 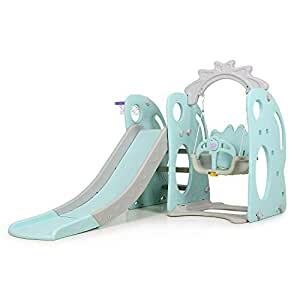 Swing and Smooth Slide- The slide and swing set consist of the accelerated region, deceleration region, and buffer stop region. Children can enjoy the speed with safety. The swing can maximum hold 60lbs with strong hangers. Also, Noise Eliminating Hook Design eliminate the noise when children are having fun with swing. Basketball Hoop- The basketball hoop could be installed at any hole on the sideboard. Therefore, parents can adjust the height based on childrenâs height. Itâs a good start for a future NBA player !!! This climber and swing set is the combination of a swing, slide and basketball hoop. Children can have fun indoor and outdoor. The theme of the product is a rabbit with big eyes. We expect every child to have curiosity explore the unknown world, like this rabbitâs perspicacious eyes. Note: There is a tiny hole at every slideâs extension part. It is required by the manufacturing process. It is easy to install and can be finished within approximately 10 minutes. Step-by-step instruction and screw-driver are included.